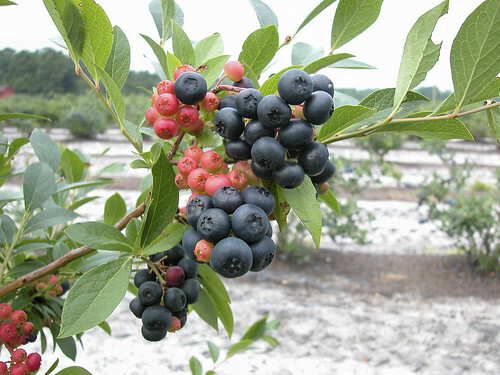 Nocturne, a winter-hardy, black-fruited blueberry developed by ARS. USDA-ARS photo by Mark Ehlenfeldt. You probably don’t think there’s anything special about picking up a tub of fresh blueberries at the store or the farmers market—the quality of the product, the freshness and the convenience of it all. If only you had to go pick the fruit from the wild yourself! Up until 1911, blueberries had to be picked from the wild, and bushes were dug from the wild that might or might not survive when transplanted elsewhere. True domestication—reproduction at the will of the grower and breeding to improve desirable traits—was beyond reach until USDA botanist Frederick Coville unlocked a longstanding mystery in 1910. Coville compared plant growth in alkaline, neutral, and acid soil. By 1908, he had pretty much dropped alkaline soil from testing. He had remarkable success with very-low-pH (or acid) soil. While most plants prefer soil at the neutral pH 7, blueberries only thrive at pH 4.5 to 4.8. That blueberry plants require moist, acid soil was a novel concept at the time and one that Coville, in his later years, would consider his greatest discovery. In 1911 came his landmark first successful crosses between two wild blueberries—one highbush and one lowbush—that had been selected for their superior qualities from a pasture in Greenfield, New Hampshire. These were named Brooks (highbush) and Russell (lowbush). The crosses he made in 1911 and 1913 resulted in 3,000 hybrids. Another cross of Brooks with a wild blueberry named Sooy in 1912 resulted in another 3,000 seedlings. Four years later, in 1916, and exactly a century ago, the first commercial cultivated crop of highbush blueberries was harvested. Much of Coville’s original wild breeding stock came from his partnership with Elizabeth White of Whitesbog, New Jersey, whose family owned a large cranberry farm, and a horticulture enthusiast herself. She acquired high-quality bushes by recruiting blueberry pickers and local residents to locate and tag desirable large-fruited bushes for use as parental stock, and then she personally went out and brought them back to Whitesbog and made them available to Coville. Coville’s historical records provide a fascinating look at USDA research efforts that took blueberries from a crop picked from the wild and sold for 14 cents a quart in 1912 all the way to a commercially grown crop of more than 553 million pounds worth more than $817 million (2014). Worldwide, current blueberry production is greater than 1.9 billion pounds. His crosses continued to be released for many years after his death in 1937 and included Bluecrop, Blueray and Earliblue—varieties still popular today with gardeners and commercial growers. By 1942, of the 18 blueberry varieties offered by Eastern growers, 14 were the result of Coville’s selection efforts or breeding. His varieties remain part of the pedigree of most varieties grown today. And the USDA research program Coville founded in New Jersey is still carrying out critical research to protect and expand the U.S. blueberry crop. Consumer demand continues to increase at a rapid pace, thanks not only to the blueberry’s taste and versatility but also to its health benefits. Let’s wish the highbush blueberry a happy 100th birthday! Blueberries are my favorite berry! Great article! Where can I find Nocturne blueberry bushes to grow in my acid-soil, sweet little two acres in the Sierra Nevada foothills in California? Thank you for a great article about a wonderful food item. I successfully grew blueberries in my backyard in Georgia. That would not have been possible without the valuable research from Mr. Coville. We all owe him and his team a debt of gratitude. Happy 100th birthday! Could you point me in the direction to locate a list of commercial current blueberry stock breeders/producers?